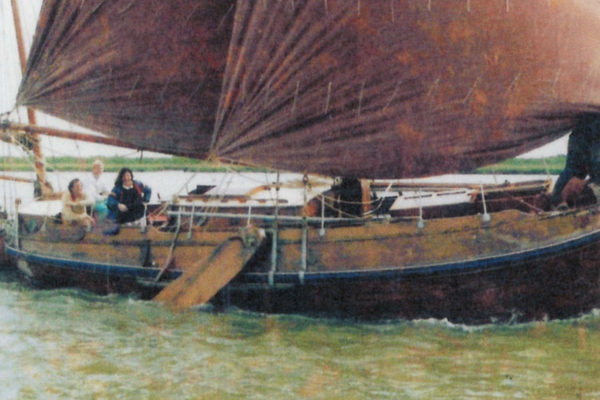 Fritz van der Mark shares his research into the demise of a Dutch botter, which ended her days on the River Deben, close to where a Saxon king was buried in his boat at Sutton Hoo, Suffolk. 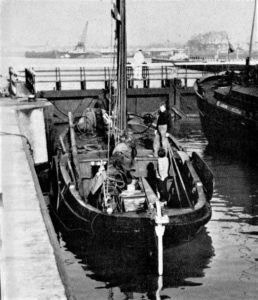 At the end of the 1950s many botters lay unemployed ashore. For little money they were sold to people who dared to adventure with a botter. There was also interest from England. The purchase of a botter from Elburg even reached the newspaper there. Inspired by this, an English couple bought the HK23 from the Harderwijk fisherman Bart Jansen. This article, published here in two parts, is primarily a reconstruction of the English period of this botter, the family who lived on board for more than 12 years and the sad fate that the ship finally had waiting for her. 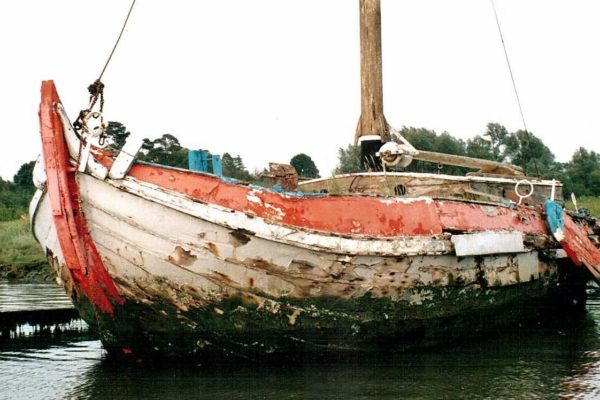 Botters in English hands: part 2 continues the story of sailing and living aboard, her steady deterioration and final demise on the River Deben, Suffolk. The story of the English interest in the Dutch botter begins in the autumn of 1958 at the famous Ferry Boat Inn in Fambridge on the River Crouch. 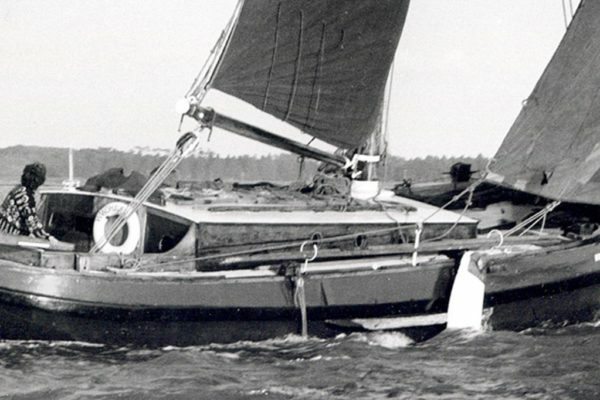 Mike Peyton, a founder member of the OGA and who later became well-known as a cartoonist, listened to a conversation, as he describes in his autobiography ‘Celebrating 50 Years of Sailing’. 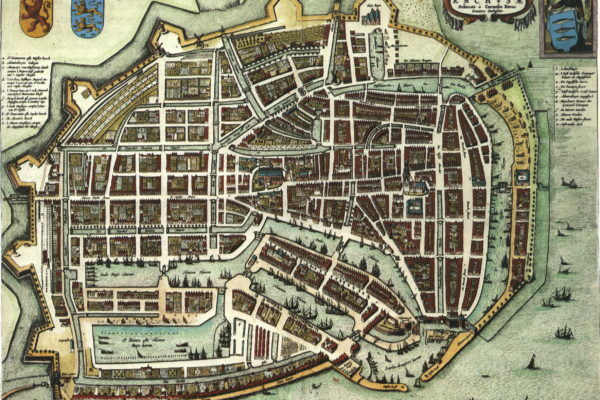 The speaker had just returned from the Netherlands and said that because of the embankments, there were rows of sailing fishing boats in the ports of the IJsselmeer for sale. Peyton did not have a lot of money, but the pound was still a hard currency. A few weeks later he owned the EB49. He had paid the ‘wooden-clogged fisherman’ £400 for the botter which was still in completely original condition. The Guardian newspaper had a column in the ’50s on Monday under the title ‘About Boats’. This was written by varying authors. 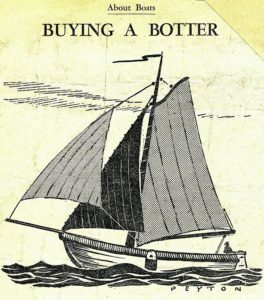 At the beginning of 1959 the column was by Mike Peyton with the title ‘Buying a botter’. Above the piece was a drawing of a botter with the name of Peyton underneath. Indeed, later on, he became famous for his nautical cartoons that he drew for magazines such as ‘Yachting Monthly’ and ‘The Practical Boat Owner’. 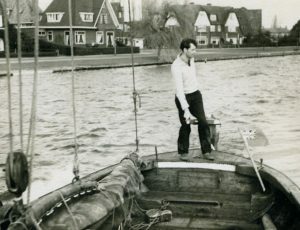 In the column he writes about the crossing to England that he made in early November 1958. The preparations for this turned out to be inadequate afterwards. With a friend who had little sailing experience, he crossed the IJsselmeer and sailed to IJmuiden. On Friday afternoon they steamed outside with the wind on the nose. It was clear at the time that they would appear late at work on Monday. That became even clearer when the engine stopped. Under sail, they tried to reach Hook of Holland, but even that did not work. 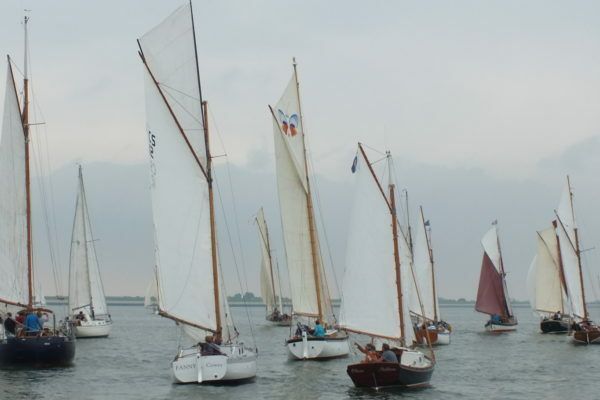 On Saturday afternoon they entered IJmuiden again. 14 days later the crossing was prepared better. The Kromhout 13 hp was well checked and there were three more or less experienced crew members on board. The departure was on Saturday afternoon, late Sunday evening they approached the Thames estuary. They had to sail high on the wind and became acquainted with a characteristic sailing property of the botter: the gluing. Eventually the wind cleared and they were able to add the jib. During the night they unexpectedly saw the light of the Kentish Knock Lightship. They suspected that they did not have the right time on board, so the data from the tidal current deviated and the dead reckoning was not correct. They decided to sail right past the lightship to ask what time it was, there appeared to be a difference of 2 hours. A lightship crew member asked for the name of the ship. They were stumped by this question, no name had yet been decided. “We do not know,” was therefore the answer. Peyton writes: “I suspect that this nightly encounter has made a very strange impression on the lightship crew.” After this, the ports of call had to be adjusted a few times. 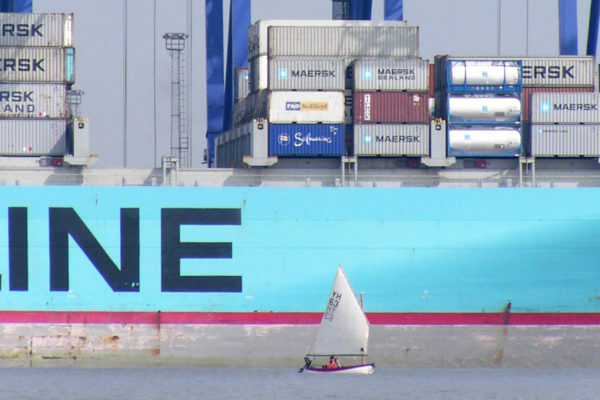 Harwich was no longer an option, so they tried to sail into the Thames. Eventually they arrived in Herne Bay on Monday at midnight, on the south of the Thames Estuary. In England, the botter EB49 was named ‘Clementine’, derived from the American folk song, ‘Oh My darling, Clementine’ via the fishery number 49. The second verse contains the lyrics: ‘Dwelt a miner, forty-niner, and his daughter Clementine’. The botter proved to be ideal for the English east coast with its shallow draft and the possibility of taking the ground. The rigging was simple and resistant to a bump, but it was heavy. Peyton found the botter on the whole to be labour-intensive. After a few years he sold ‘Clementine’ and switched to a smaller yacht that he could sail with his wife and two children. No further information is available about the further fate of the botter. During this period, Roy and Rosalind Elwood from Colchester were looking for a ship which they could sail and live on. Their many quests were frustrating, ships visited were in too bad a state or too expensive. On a visit to a friend they read Mike Peyton’s column ‘Bying a Botter’ in the Guardian. They got excited and the next weekend they took the night boat to Hook of Holland to find a suitable botter. They took a week to search and visited almost all IJsselmeer ports. Eventually they looked at a promising botter in Harderwijk for the second time. It wasBart Jansen’s HK23. He was a small, agile man who went to great lengths to promote his botter. He kicked the hull with his clogs to emphasise the soundness of the ship. 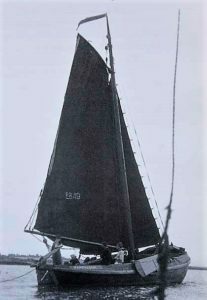 The botter had a Ford car engine that stood for maintenance at the garage, the foresail was with the sailmaker. In the fisherman’s small house they looked at the sails stored together with nets and fishing accessories in the loft. There seemed to be quite a few children living at the house with beds in every corner of the room. No new defects were found and negotiations for the purchase started. 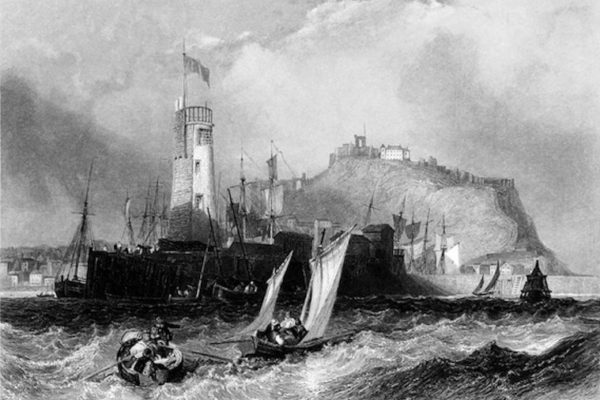 The Scottish wife of the local grocer acted as interpreter in which the ship terms and the dialect of the skipper were obstacles. Jansen did his utmost to sell the botter as well as possible. He wore his Sunday suit and really enjoyed it. Proposals and counter-proposals were made and in the end they agreed a price to everyone’s satisfaction. A bottle of wine was opened and people toasted the transaction. Jansen promised that he would prepare the botter and Roy and Rosalind would pick her up 14 days later. The Elwoods prepared thoroughly for the crossing. An insurance company was approached, but the botter was not judged proper enough to make the crossing. In the unlikely event that the ship would reach the English coast they would be willing to inspect the ship and issue a quote. The 10% import tax was settled at a customs office and Dutch money was arranged to pay for the botter. Furthermore, things like cards, pilots and tide tables from a friend were borrowed. Even a Dutch guest flag was not forgotten. Just before Easter they stepped on the night boat to Hook of Holland. 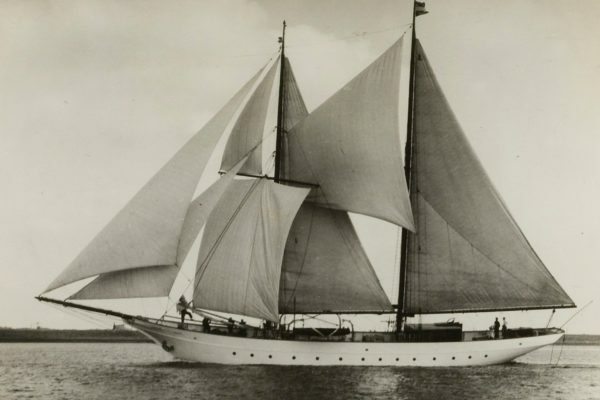 The first day they sailed to the Buiten-IJ and spent the night at anchor. Via Amsterdam, Gouda, Rotterdam and Dordrecht they arrived at Zierikzee as the last Dutch port. Under favourable conditions they sailed to Ostend at night. Eventually they crossed from Dunkirk to Ramsgate. The botter stayed there for a week because their free days were gone. During the following weekend they sailed the last part, the engine stopped but they reached West Mersea in good order.